There are some condiments in our house like ketchup and soy sauce that gets used constantly. But sometimes there’s a meal that requires something new and then the bottle just sits there until one day we realize it has been 5 years and it should get tossed. We lost power recently and when we cleaned out the fridge there were many thing that I did not even remember owning. I rarely have any condiments on my food, if ever at all. For some reason, I almost always prefer the food just the way it is, without any extra sauce or whatever it could be. Also, I don’t even know what tartar sauce is, except for something Spongebob says instead of swear words. …OK, I looked it up while still writing this, but I find it weird that “tartar” can be both a sauce and dental plaque. 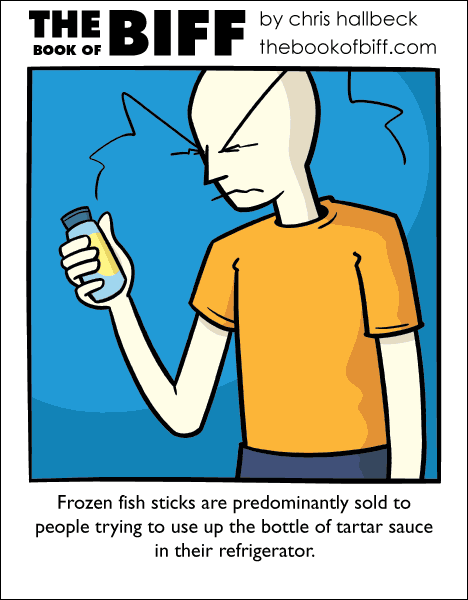 That’s why I usually grab packets of tartar sauce from snack bars that sell fish sandwiches and the like. toss ’em in the fridge, and if I buy fish sticks in the near future, I’m prepared. If not, it’s no big thing to trash them later. The Berrymans have a LOT of good bits; been a while since they played The Coffee Gallery Backstage. Look them up! The late Phyllis Diller (Celestia and Luna rest her blessed soul!) had a joke that her cheese was so old that it was barking to be let out of the refrigerator. Waaaaaaiiiitttt-aaammmiiinnnuuuttte; last I’d heard, she only kept ironing in the fridge (but granted, that’s been a while, really old material.) *Sigh* already miss the nerve-ends hairdo. Thanks, Phyllis! Sharp, but never Mean! I haven’t bought tartar sauce in years. I just make my own. A dab of mayo, a forkful of relish, a small squirt of mustard, stir with the fork you used to add the relish, and there you go. Oh Em Gee this is so TRUE!